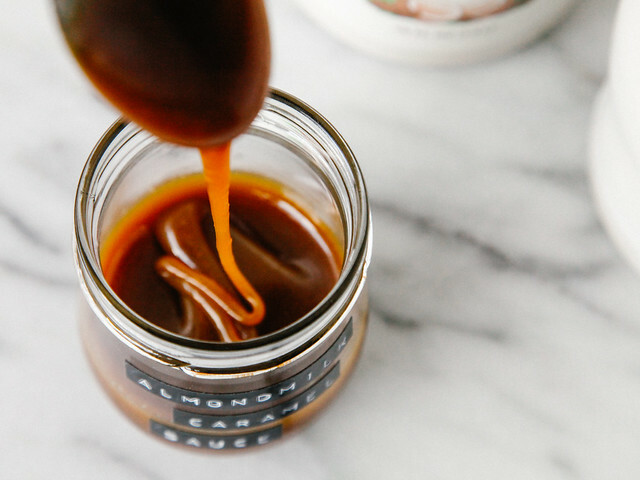 After 11 months of making dead end promises to you guys via email, it's finally here: ALMONDMILK CARAMEL SAUCE. This is kind of big news because it means we no longer have to waste $2-3 on inconsistent cans of coconut milk. It's also big news because this stuff tastes so much more like the real thing and, admittedly, kicks my coconut milk variety to the curb. 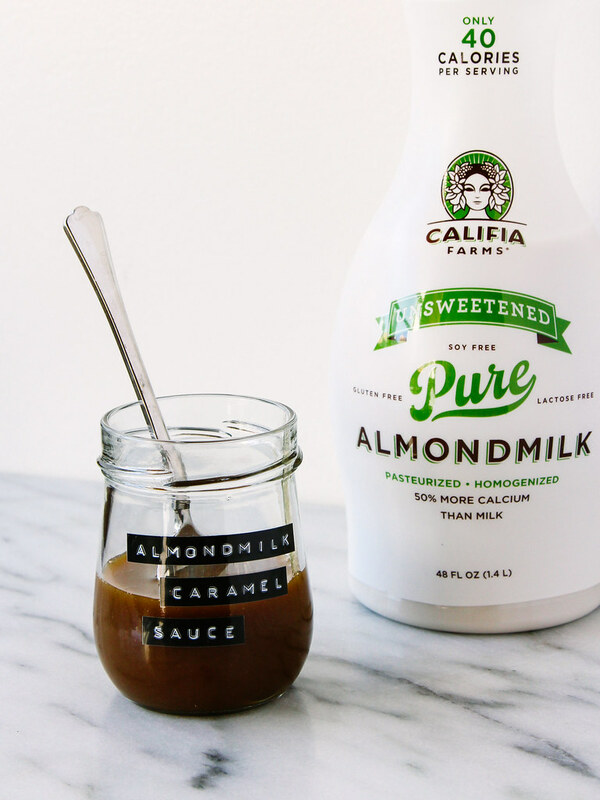 Although there are times when I really enjoy the coconut undertones of coconut milk caramel sauce, for an everyday application I'd prefer something that tastes a bit more like the stuff that's made with heavy cream, and that's where almondmilk comes in. 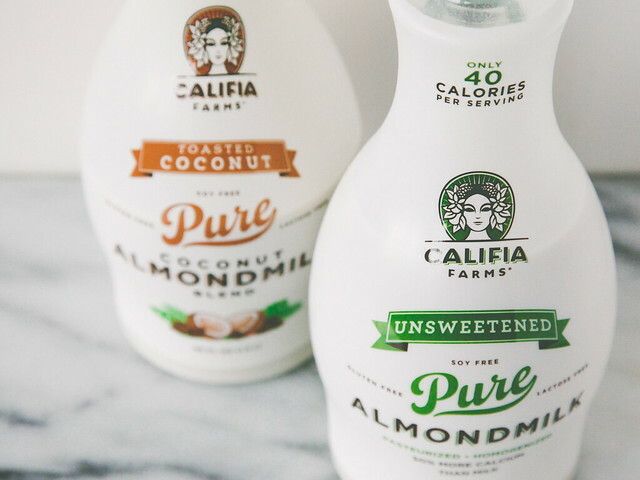 Califia Farms almondmilk, to be exact. Chances are you've seen their almondmilk (and cold brew coffee! and citrus juices!) at your local Whole Foods or natural grocery store. Or maybe not because damn near every time I go to Whole Foods they're sold out. But next time you're there, keep your eyes peeled for the good stuff that comes in the shapely bottles with the hella sleek design - because yes, it tastes just as delicious as it looks. So delicious that Thom - who has never been the kind of guy to relax with a glass of anything that isn't water or beer - regularly pours himself a generous portion of the toasted coconut stuff. I've always thought it was strange until I was eating chocolate and dried apricots out of the fridge the other day and thought I should probably stop hating on his new almondmilk habit and give it a go. So I screwed off the cap and took a heavy straight-from-the-carton swig of it. And now I'm an almondmilk drinker, too. But enough about the almondmilk - how about some real deal caramel? Notes: For this recipe I used Califia's unsweetened almondmilk, but I've also made it with their toasted coconut version and it turned out just the same. 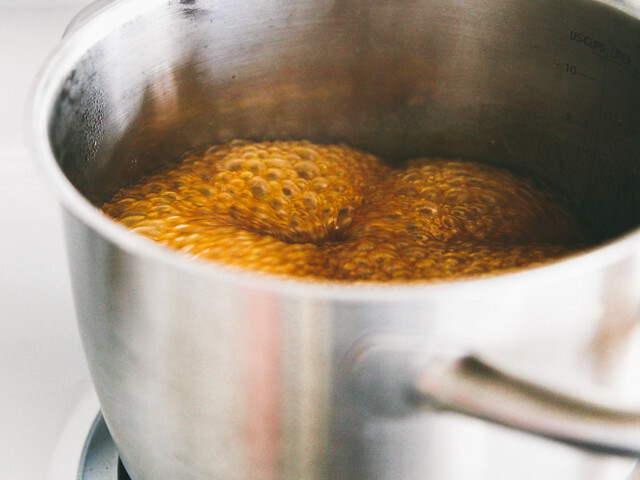 I know the addition of brown rice syrup and cream of tartar is annoying, but they're crucial components of this caramel sauce as both are necessary to prevent crystallization - so don't leave them out. Seriously, don't. If you can't get your hands on brown rice syrup you could use corn syrup (not high fructose) but make sure it's non-GMO because genetically modified foods are bad news, y'all. If you don't have cream of tartar, 1/4 teaspoon of lemon juice will work in a pinch. Also, it's important that you don't mix the sauce more times than specified in the instructions or else you may interrupt the caramelization process. Update: A number of you have emailed asking if there's any way around the rice syrup and cream of tartar. For long term storage, no. But if you plan on eating the caramel immediately, yes. 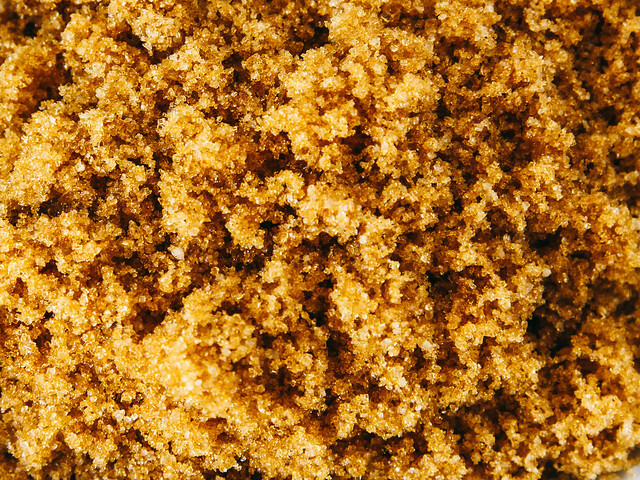 Without the rice syrup and acid, the sauce will crystallize within a day. In a medium size saucepan over medium heat, combine the milk, sugars, brown rice syrup, and cream of tartar; stir with a silicone spatula (or any silicone device capable of such a task) then let the mixture cook for 25 minutes, without stirring. While cooking, it should boil as shown in the photo above. If it's not boiling after five minutes on the stove, increase your heat just a bit. After 25 minutes, give it a good stir with the spatula then remove from heat if you prefer caramel sauce that's thick but pourable from the fridge. If you'd prefer something that needs to be warmed (in a hot water bath) before pouring, cook for an additional 2 minutes. Pour caramel sauce through a sieve and into a glass jar then seal with a lid (do not let it cool without a lid, as you may get a thick layer of hardened caramel on top). Refrigerate for at least four hours; sauce will thicken as it cools. Will keep in the refrigerator for up to one week.